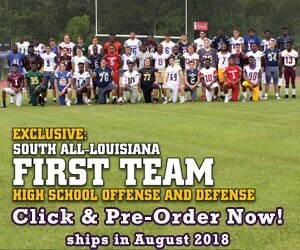 August 19, 2010 – With the plethora of stars Redemptorist High School has to offer, several great athletes may fall under the radar. One of these young talents trying to make a name for himself is senior Justin Arnett. The 6-foot-2, 270-pounder is being recruited by schools as an offensive guard. Arnett has proved himself as a strong guy in the weight room, and has impressive lift numbers. He benches 355 pounds, squats 430 pounds and cleans 285. He also runs the forty in 5 seconds flat. But Arnett’s talents aren’t limited to the football field. He is also an outstanding member of the Redemptorist wrestling team, and was crowned state champion in 2009. Arnett said the he enjoys wrestling because of the head-to-head action, and said that he relates techniques between the two sports. Arnett is currently keeping his school options open, but listed three universities as potential destinations – Nicholls, Southeastern and Northwestern. “[Those schools] are close to home and I like the academics,” Arnett said. Arnett gave his efforts in helping Redemptorist finish with a 10-2 season and make a deep run into the playoffs. While every game is as important as the last, Arnett said he looks forward to the rivalry of the Parkview Baptist game each season. When off the field, Arnett’s favorite vacation spot isn’t that of a typical teenager. Arnett said he enjoys visiting the mountains of Cheyenne, Wyoming more than any other place. Arnett is also a diehard New Orleans Saints fan, and said seeing the hometown heroes get their first title was a great sight.